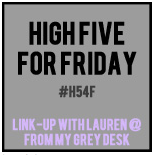 I’m going to start linking up each week with Lauren over at From My Grey Desk and share my five favorite things from the week. 1. This week has been crazy. My husband was supposed to leave this morning for a 9 month deployment but we found out Wednesday that the deployment has been cancelled for now! Woohoo!! Super exciting news for us! 2. So we had to celebrate at our favorite Mexican restaurant. 3. Homemade baked potato soup. 4. It was a great Friday at school today! My students watched the movie “Holes” because we just finished reading the novel and I got to enjoy my Starbucks. 5. I was a guest over at Tatertots and Jello! Check out the project I shared HERE. I have to add that Jen is AMAZING!! Every time she emailed me I felt like I was talking to a celebrity. Baked potato soup sounds delicious! I was just trying to figure out what kind of soup I wanted to make for dinner since it’s all cold and wet out. What great news that your husband didn’t have to leave this week! So excited for you! I have been all about soup lately for dinner too. I think I have made that same exact recipe in the past week, or something very similar. It looks delicious! !